The past decade It’s been our privilege to work with Sammy Obara and the Honsha team. Good fun, mutual prosperity, and never a harsh word in all that time. We’re ‘market partners’ in the truest sense. I’m pleased, therefore, to be joining Sammy in beautiful San Diego on June 8 – 9 for a series of workshops. 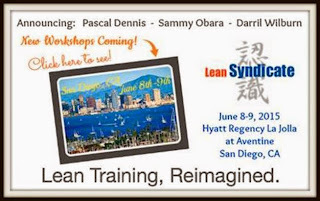 It’s a fine program which we call Lean Training Reimagined. The program addresses a challenge we’ve been mulling over for some time. How to make training sessions real? How to ensure that folks can apply what they’ve learned the next morning? We’re hopeful that Lean Training Reimagined can help to answer these questions.